The 814 is a guitar with a well-earned reputation, offering a wonderful playing experience across the fretboard. 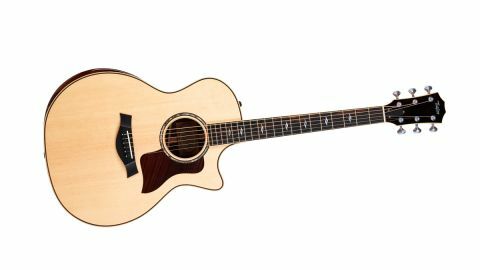 The upgrades improve upon an impressively versatile design, with the Adirondack spruce bracing bringing a tangibly richer low-end. The premium price is prohibitive for many players. When Taylor’s master luthier Andy Powers took a leading role in redesigning the company’s 800 series back in 2014, it was a landmark in the company’s story of innovation, refining and enhancing a popular series with a combination of technological advancements. And the Grand Auditorium 814ce was the jewel in the cutaway crown. The original model that helped make Taylor’s reputation was always likely to be the first on the wishlist for Powers to work on and it was eventually chosen to debut the second iteration of Taylor’s Expression System. on the spruce (reduced from 6 to 3.5 ‘mils’/thousands of an inch), to tone-aiding protein glue and the fundamental switch from straight to Advanced Performance Bracing, slanted towards the back to further accentuate the rosewood’s low-end characteristics. The redesigned model was a winner with players, an all-rounder with its own distinct flavour that still exuded Taylor’s values. So what does this Deluxe edition bring to the success story? First, let’s take a look at what’s changed. There are three new custom-style features here that all have their own distinct impact on the player’s experience with this version of the 814. The brushed-satin chrome Gotoh 510 tuners are a change to Taylor’s own-logo’d brand. These tuners are a top-of-the-range option with a higher 21:1 gear ratio that delivers on the reputation - they’re very smooth to the touch and in action. They also have a fresh aesthetic that falls somewhere in the region of a retro-futurist butterbean. Whatever it is, we like it. The second addition is the armrest bevel for player comfort. This example is smaller than what we’ve seen on the 900 series and, cosmetically, the choice of rosewood brings continuity with the other appointments. But the most fundamental upgrade, as we’ll find out when playing, is the change to Adirondack spruce for the Advanced Performance Bracing. We’ve seen a few limited examples of the 814ce being made by Taylor with this relatively scarce tonewood - at least in quantities for guitar building - as a top material, so we’re interested to see what the effect is when it’s used for internal structure. Especially as we recall Bob Taylor’s claim that it offers 80 per cent of the tonal improvement an Adirondack top can offer. Sitting down with the guitar, that armrest bevel quickly dispels any notion that it could be a ‘Marmite’ feature, strengthening the initial relationship with the guitar by drawing us immediately closer to the body. We can certainly see why Taylor has opted to bring it to its new entry-level Academy series - it just feels right. This is not the slinkiest Taylor we’ve played. The tension from the Elixir Phosphor Bronze HD Light string set it’s shipped with (essentially a hybrid of 0.013 and 0.012 sets that Taylor recommends for this shape) may not suit softer fingerpickers - they’ll likely choose to opt for a standard lighter gauge. But that’s not to say this is not a responsive experience, far from it, and the slightly more muscular feel of the strings feels right for the voice we find. Which is really something to savour. There’s a notably deeper, richer presence from the Adirondack bracing across the tonal spectrum... full of balanced detail. There’s a notably deeper, richer presence from the Adirondack bracing across the tonal spectrum, and combined with trademark Taylor clarity, it offers a tonal character for this deluxe version that’s full of balanced detail. Really digging in with heavy strumming to test the robust ’springy’ qualities Taylor claims for Adirondack, then dropping back to lighter strumming, it responds wonderfully - the darker low-end always underpinning but never overpowering the more rounded mids and defined treble frequencies. Open string positions become addictively orchestral as a result, especially exploring the potentials of DADGAD, while bluegrass flatpicked licks sound strong, woody and resonant. The 814ce’s reputation as a pro-grade modern all-rounder has been enhanced by this edition; it’s certainly what Powers himself describes as “optimising the tactile experience of an instrument”. It’s mission accomplished with the new armrest and Gotoh tuners, because there’s no doubt they improve the 814ce’s existing strengths. And we can’t help but wonder whether ‘once you try Adirondack, you can’t go back’ could become an advertising campaign based on the full-bodied qualities we find in play. But how you may view this edition could depend on whether you believe the added premium is justified in bringing custom shop-esque options to the wider market. Take some comfort, then, in the knowledge that UK street prices are actually much closer to those for the regular model.